We are the Heim family. We come from four different countries: America, Russia, Ethiopia, and Ukraine. 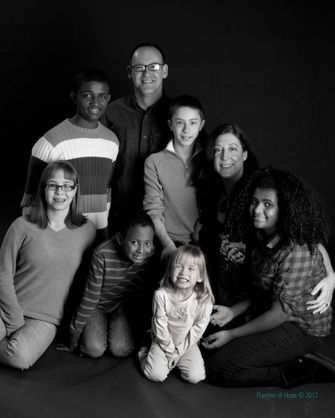 Except for my husband and I, everyone has become a Heim through adoption. By the time we adopted a child with HIV, we had already adopted so many children who had been labeled with red flags that HIV had become no big deal. Our first child was a foundling. She came with no history. Because of this she was placed as “special needs” because there was just no information about her beyond a thin police report. It was revealed to us after meeting our second child that there was a good possibility that he had Hep C. We had done no research about it, and in 2000, when we tearfully called our specialist at 1:00am from Russia in order to reach him during Chicago business hours, he emphatically recommended against completing his adoption. “That would be like bringing AIDS into your home!” he stated with horror. We chose to bring our boy home, and when he reached 18 months of age we discovered that he was negative for Hep C.
Our third child was recovering from mumps and suffering from chronic Malaria when he came home at 3 and a half. We sought the proper treatment for him and that little dude didn’t get sick with ANYTHING for two years, not even a cold! It was about this time that I started working with Project HOPEFUL. I didn’t have any specific roll, I was really more of a lackey doing whatever needed to be done. What I mostly did was learn a whole lot about HIV and the devastation it was bringing to millions of children around the world. We began our adoption from Ukraine, and after many setbacks and trials, Dasha came home. We have always been open about her HIV. We don’t wear a sign saying one of our children is HIV+, but we don’t keep it a secret either. In fact when she came home, we found out that people assumed that we already had a child with HIV. I guess it’s because we have 3 kids from Ethiopia. Everyone knows that everyone in Africa is infected with HIV, right? Ok, not really, but that is the assumption. No one thinks it’s the tiny BLOND. Surprise! There is a lot of discussion about privacy and respecting our children’s stories and keeping their status a secret for them to disclose or not. This is not just about HIV, but also about their adoptions in general. I understand that in theory, but my opinion is that in practice it simply cannot be achieved in any kind of healthy way. The reason is simply this: if a child is an orphan, they are alone and they and their information are on an island, so to speak. They are in complete command of their “story”. Once they become a part of say, our family, it is no longer just his story or her story. It is now “our story.” I am the mother of adopted children. That is how I became a mom. How do I not disclose that this 3 year old from Africa, who clearly did not come out of my belly, is adopted because that’s his story? You see? It’s my story too. I am the mother of an HIV+ child. It is now part of who I am because it is part of who we are. Because she is my daughter, her HIV is mine too. Currently I manage it. I administer her medication. I deflect comments from the uninformed through sharing truth. I am responsible to cultivate her self worth because I am her mom and she is my daughter. If we choose to keep a fact like HIV secret rather than private, we give a whole lot of power to something that doesn’t deserve it. Lots of energy must be poured into guarding a secret. This leads to discomfort, deception and fear; always wondering what will happen if someone finds out. In light of the kind of behavior this would lead to, how can my child help but begin to believe that there must be something shameful or bad about her? We have chosen not to live this way. The only way to refute the power of stigma is to not give it a foothold in our lives. We have been open about Dasha’s status. We discuss her HIV as we would her asthma or her previous orphan status or her blond hair. It is what it is. It’s something she has. It’s not who she is.